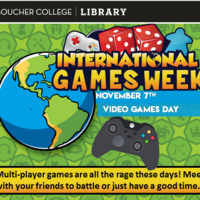 Video Games Day: Multi-player games are all the rage these days! Meet up with your friends to battle or just have a good time. For more information, please contact Amanda Boone, President of the Board Game Club, at amboo001@mail.goucher.edu.